illnesses in pigment grinders in 1713. Today we hope to make readers more aware of the hazards of working with painting and drawing media and the precautions you can take to work safely. 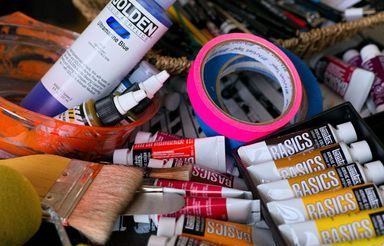 Working safely can involve changes in how you select your art materials, and how you handle them. This data sheet is primarily intended for individual adult artists, and the precautions discussed here may not always be sufficient for classes. For more information on classroom hazards, see our data sheet "Oil Painting Hazards in Classrooms." Children under the age of 12 should not use or be around artists' paints or professional drawing media. They should only use art materials that are approved for use with children. See our data sheet "Children's Art Supplies Can be Toxic" for more information on children. Pigments Painters use pigments in oil paints, acrylics, watercolor paints, gouache, encaustic, poster paints, casein paints and tempera. Sometimes commercial paints such as oil enamel, epoxy paints and automobile paints are used. Paints are pigments mixed with a vehicle or binder. Both inorganic and organic pigments are used as colorants. acrylic, gouache, tempera and casein. Water is used for thinning and cleanup. 1. See section above for pigment hazards. 2. Acrylic paints contain a small amount of ammonia. Some sensitive people may experience eye, nose and throat irritation from the ammonia. Acrylics and some gouaches contain a very small amount of formaldehyde as a preservative. Only people already sensitized to formaldehyde would experience allergic reactions from the trace amount of formaldehyde found in acrylics. The amounts can vary from manufacturer to manufacturer. 3. Casein paints use the protein casein as a binder. While soluble forms are available, casein can be dissolved in ammonium hydroxide which is moderately irritating by skin contact and highly irritating by eye contact, ingestion, and inhalation. 4. All water-based paints contain a preservative to prevent mold or bacterial growth. Sometimes artists add preservatives when they make their own paints. Although present in small amounts, certain preservatives may cause allergic reactions in some people. 1. See section above for precautions when mixing dry pigments. 2. If you add your own preservative, avoid using sodium fluoride, phenol or mercury compounds. For tempera, a small amount of pine oil works for short periods of time. 3. If you experience eye, nose or throat irritation while using acrylics, opening a window is usually sufficient; if not try a window exhaust fan. 4. If you mix casein paints using ammonium hydroxide, you will need a window exhaust fan to provide ventilation. 5. Wear gloves, goggles and protective apron when handling ammonia. An eyewash fountain should be available when handling ammonia. often used as a thinner and for cleanup. are used in oil painting mediums, for thinning, and for cleaning brushes. paints used by artists also contain solvents. 2. All solvents can cause defatting of the skin and dermatitis from prolonged or repeated exposure. Turpentine can also cause skin allergies and be absorbed through the skin. 3. Acute inhalation of high concentrations of mineral spirits, turpentine vapors, and other solvents can cause narcosis, which can include symptoms of dizziness, headaches, drowsiness, nausea, fatigue, loss of coordination, coma, as well as respiratory irritation. 4. Chronic inhalation of large amounts of solvents could result in decreased coordination, behavioral changes and brain damage. Chronic inhalation of turpentine can cause kidney damage and respiratory irritation and allergies. Odorless mineral spirits and turpenoid, in which the aromatic hydrocarbons have been removed, are less hazardous. 5. Ingestion of either turpentine or mineral spirits can be fatal. In the case of mineral spirits, this is usually due to chemical pneumonia caused by aspiration (breathing in) of the mineral spirits into the lungs after vomiting. 6. Natural resins (copal, damar, rosin, Japanese Lacquer) may cause skin irritation or allergies. Rosin dust can cause asthma. 7. Encaustic involves suspending pigments in molten wax. If the wax is overheated, flammable wax vapors and wax decomposition fumes are produced, which are strong respiratory irritants. 8. Epoxy paints consist of an epoxy resin component containing the pigment, and a hardener component. The epoxy resin may contain diglycidyl ethers which are irritants, may cause bone marrow damage, and are suspect carcinogens. Epoxy hardeners may cause skin and respiratory allergies and irritation. 1. Whenever possible replace turpentine or ordinary mineral spirits with the less toxic odorless mineral spirits. Mineral spirits is also less flammable than turpentine, since its flashpoint is over 100 F (38 C), while turpentine has a flashpoint of 95 F, (35 C). 2. Apply the same health and safety considerations for the use of "citrus" or "pine" solvents. These have been found to be quite irritating to the skin and eyes. 3. If possible, artists should set up their easel about 3 feet from a window that has a fan exhausting at work level and pulling the solvent vapors away from your face. The rest of the window should be blocked off so that contaminated air doesn't reenter the room. The size of fan needed can be calculated based on how much solvent is evaporated. 4. Techniques such as turpentine washes will require a lot of ventilation because they result in the evaporation of large amounts of solvents in a short period of time. Acrylic paint can be substituted for underpainting. 5. Ventilation only needs to be provided while the solvent is evaporating from the canvas, not during the time while the oil paint film is drying (oxidizing). 6. Wear neoprene gloves while cleaning brushes with mineral spirits or turpentine. 7. Used solvent can be reclaimed by allowing the paint to settle and then pouring off the clear solvent. Small amounts of solvent can be disposed of by evaporation in a location that will not expose anyone to the solvent vapors. 8. Paint can be removed from your hands with baby oil, and then soap and water. 9. Wax should be only heated to the minimum temperature needed for proper flow of the paint. Do not heat with open flame or hot plate with exposed element. Use a double boiler or electric frying pan. 10. If there isn't adequate ventilation provided while using epoxy paints, wear gloves and a NIOSH-approved respirator with organic vapor cartridges. 11. During pregnancy and nursing, switch to water-based paints to avoid exposure to solvents. See our data sheet "Reproductive Hazards in the Arts" for more information. paint sprays, varnishes, and adhesive sprays. 1. Spray mists are particularly hazardous because they are easily inhaled. If the paint being sprayed contains solvents, then you can be inhaling liquid droplets of the solvents. In addition the pigments are also easily inhaled, creating a much more dangerous situation than applying paint by brush. 2. Aerosol spray paints have an additional hazard besides pigments and solvents. They contain propellants, usually isobutanes and propane, which are extremely flammable and have been the cause of many fires. Other aerosol spray products such as retouching sprays, spray varnishes, etc. also contain solvents, propellants and particulates being sprayed. 3. Airbrushing produces a fine mist which is a serious inhalation hazard because artists work so close to their art work. Airbrushing solvent-containing paints is especially dangerous. 4. Spray guns are less common in art painting but usually involve spraying much larger quantities of paint than either spray cans or airbrush. Spraying solvent-based paints is a serious fire hazard. 1. See section above for precautions with pigments. 2. Try to brush items rather than spraying if possible. 3. Use water-based airbrushing paints and inks rather than solvent-based paints. 4. Use spray cans or an airbrush in a spray booth if possible. If the material sprayed contains solvents, then the spray booth must be sparkproof. There should be no sources of ignition (electric switches, motors, flames etc.) within 10 feet of the spray booth opening. Also, all light fixtures within 20 feet of the spray booth should be enclosed and shatter-proof. Spray booths that recirculate air rather than exhausting air to the outside are not recommended. 5. If ventilation is not adequate, then respiratory protection is necessary while air brushing or spraying. Use a NIOSH-approved respirator equipped with dust and mist filters for spraying water-based paints, and a respirator with organic vapor cartridges and dusts and mists (or paint spray) prefilters for spraying solvent-based paint. 6. Never try to spray paint by blowing air from your mouth through a tube. This can lead to accidental ingestion of the paint. which do not create dust. 1. Pencils are now made with graphite, rather than lead as was true centuries ago, and are not considered a hazard. Colored pencils have pigments added to the graphite, but the amounts are small so that there is no significant risk of exposure. Over 10 years ago, a significant hazard in pencils was from lead chromate paint on the exterior of yellow pencils. However this has since been eliminated as a risk. 2. Charcoal is usually made from willow or vine sticks, where wood cellulose has been heated without moisture to create the black color. Compressed charcoal sticks use various resins in a binder to create the color. Although charcoal is just considered a nuisance dust, inhalation of large amounts of charcoal dust can create chronic lung problems through a mechanical irritation and clogging effect. A major source of charcoal inhalation is from the habit of blowing excess charcoal dust off the drawing. 3. Colored chalks are also considered nuisance dusts. Some chalks are dustier than others. Individuals who have asthma sometimes have problems with dusty chalks, but this is a nonspecific dust reaction, not a toxic reaction. 4. Pastel sticks and pencils consist of pigments bound into solid form by a resin. Inhalation of pastel dusts is the major hazard. Some pastels are dustier than others. Pastels can contain toxic pigments such as chrome yellow (lead chromate) which can cause lung cancer, and cadmium pigments (which can cause kidney and lung damage and are suspect human carcinogens). Blowing excess pastel dust off the drawing is one major source of inhalation of pastel pigments. Pastel artists have often complained of blowing their nose different colors for days after using pastels, a clear indication of inhalation. 5. Crayons and oil pastels do not present an inhalation hazard, and thus are much safer than pastels. Some oil pastels can contain toxic pigments, but this is only a hazard by accidental ingestion. 6. Both permanent and workable spray fixatives used to fix drawings contain toxic solvents. There is high exposure by inhalation to these solvents because the products are sprayed in the air, often right on a desk or easel. In addition you can be inhaling the plastic particulates that comprise the fixative itself. 7. Never try to spray fixative by blowing air from your mouth through a tube. This can lead to accidental ingestion of the fixative. 1. Use the least dusty types of pastels, chalks, etc. Asthmatics in particular might want to switch to oil pastels or similar non-dusty media. 2. Spray fixatives should be used with a spray booth that exhausts to the outside. If use of spray fixatives is occasional, you can use them outdoors with a NIOSH-approved respirator equipped with organic vapor cartridges and dust and mists filter for protection against inhalation of solvent vapors and particulates. An exhaust fan is also needed to remove organic vapors and particulates. 3. Don't blow off excess pastel or charcoal dust with your mouth. Instead tap off the built up dust so it falls to the floor (or paper on floor). 4. Wet-mop and wet-wipe all surfaces clean of dusts. 5. If inhalation of dusts is a problem, a NIOSH-approved disposable toxic dust respirator can be worn. pen and ink and felt tip markers. more used in teaching or commercial art. 1. Drawing inks are usually water-based, but there are some solvent-based drawing inks. These usually contain toxic solvents like xylene. 2. Permanent felt tip markers used in design or graphic arts contain solvents. Xylene, which is a highly toxic aromatic hydrocarbon, is the most common ingredient; newer brands often contain the less toxic propyl alcohol (although it is an eye, nose and throat irritant). The major hazard from using permanent markers results from using a number of them at the same time at close range. 3. Water-based markers do not have an inhalation hazard although there is concern about the dyes used in these (and the permanent markers). 4. Some children's markers are scented, with odors resembling fruits or flowers of the same color. Although they are not toxic, there is some concern about the odorants causing possible allergic reaction. However a more serious concern is that they teach young children to sniff and taste their art materials - the exact opposite of the desired attitude. 1. Use water-based markers and drawing inks if possible. 2. Alcohol-based markers are less toxic than aromatic solvent-based markers. 3. Solvent-based drawing inks and permanent markers should be used with good dilution ventilation (e.g. window exhaust fan). 4. Never paint on the body with markers or drawing inks. Body painting should be done with cosmetic colors. 5. Children should only use approved water-based markers and drawing inks approved for children. Do not use scented markers with children. Sources of Additional Help Written and telephone inquiries about health hazards in the arts will be answered by the Art Hazards Information Center of the Center for Safety in the Arts. The Information Center has a variety of written materials available on this subject. Permission to reprint this data sheet may be requested in writing from the Center. Enclose a self-addressed, stamped envelope for our publications list. CSA is partially supported with public funds from the National Endowment for the Arts, New York State Council on the Arts, the New York City Department of Cultural Affairs and the New York State Department of Labor, Occupational Safety and Health Training and Education Program.